Thanks for all those who have affiliated to the Trades Council this year. Our sole source of income is affiliation fees, and so we need branches to affiliate or re-affiliate for the year ahead. Please fill in this affiliation form to affiliate or re-affiliate to Camden Trades Council for 2016. 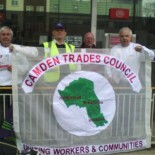 This entry was posted on December 22, 2015 by CAMDEN TRADES COUNCIL.